Popularly used during wedding dances, dancing events and other social events, foxtrot is regarded as the Rolls Royce among the standard dances. Smooth and elegant, foxtrot has been the favorite choice of many ballroom dancers. Just think about the iconic dance partners Fred Astaire and Ginger Rogers as they travel smoothly across the ballroom floor. If you may be unfamiliar with the foxtrot, it is a smooth, progressive dance characterized by long, continuous flowing movements across the dance floor. The foxtrot is danced to big band (usually vocal) music. The dance is similar in its look to waltz, although the rhythm is in a 4/4 time signature instead of 3/4. Due to the time signature, dancers are able to enjoy the foxtrot at wide variety of both songs as well as tempos. Although the origin of the foxtrot is debatable, many would agree that the foxtrot was developed in the 1910s. There are numerous entertainers who contributed to the creation of the foxtrot, such as the popular dancing couple Vernon and Irene Castle, however one notable dancer is Harry Fox. Multiple people view this vaudeville actor to be “the father of foxtrot”. One of the first times people experienced the foxtrot was in the early 1900s, specifically 1914. During one of Fox’s vaudeville shows in New York, he decided to trot to ragtime music, rather than dancing to it. Naturally, coupling ragtime music with trotting was comical, yet in no time his dance moves were an early 20th century sensation. Audiences across the nation excitedly imitated his steps and fondly referred to it as “Fox’s Trot”, which would later become known as the Foxtrot. While the height of popularity of the foxtrot was during the 1930s, there was a high regard for this dance that continued well into the 1940s. The music people danced the foxtrot to remained to be ragtime. However by the middle of the century, a shift in the entertainment industry would soon impact the foxtrot. By the 1950s, rock and roll music was created yet fortunately this genre of music continued to pave the way for the foxtrot. The song “Rock around the Clock” by Bill Haley, especially contributed to the surge in popularity for the foxtrot. Altogether, the foxtrot possesses a fascinating history. 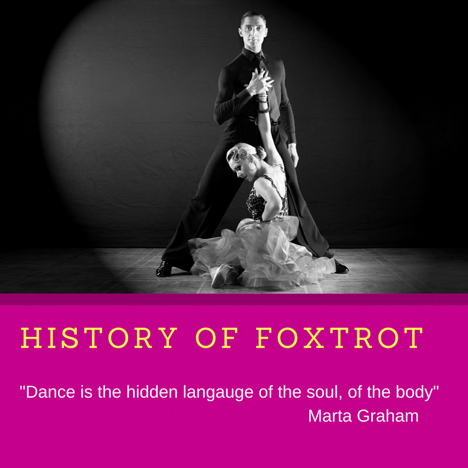 Starting from Harry Fox’s trotting in the early 20 century to today’s social gatherings and ballroom competitions across the world, the foxtrot has endured throughout the decades. Its distinct, progressive, and flowing movements that are coupled with quick, low steps have proved to be ageless. With the foxtrot’s abiding flexibility, it has naturally evolved throughout the decades. Today, there are multiple styles of foxtrot that include American Social Style, American Continuity Style, and International Style. If you wish to learn how to dance the foxtrot and enjoy its enduring appeal, you can schedule your dance lesson at Lake Shore Dance Academy today. We would be honored to help you being your dancing journey.